After a grim loss at Cal, the Pac-12 champion Huskies fared only slightly better at Stanford Sunday, winning 62-61 and inspiring little confidence. The annual trip to the Bay Area brought the Huskies men’s basketball team back to earth. But at least they are not beneath it. Despite the 76-73 loss to the Bears, UW (23-6, 14-2) backed into its third outright conference crown and the fifth conference championship since 1953, thanks to losses by Oregon State and Arizona State. But anyone thinking the Huskies would take out their embarrassment at losing to the Bears (2-15, 7-22) on the Cardinal, was mistaken. In foul trouble early and often, the Huskies had to go through eight ties and 17 lead changes before prevailing against the Cardinal (15-14, 8-9), which generously missed 10 of their 25 free throws to fall by its own hand. At least the Huskies, whose defense leads the Pac-12 with a 64-point average, down the stretch got cranky. “We got four stops on the final five possessions,” coach Mike Hopkins said. “We were tough. The win did something for pride but did little to knock down the argument that being the Pac-12 champ was little more than being the world’s tallest dwarf. The Huskies have home games remaining against Oregon State Wednesday (7 p.m., Pac-12 Networks) and Saturday versus Oregon (7 p.m., ESPN) before the start of the league tournament in Las Vegas. But two more wins likely won’t blow away much stink from the debacle in Berkeley, the first bad loss in a season without a signature win. 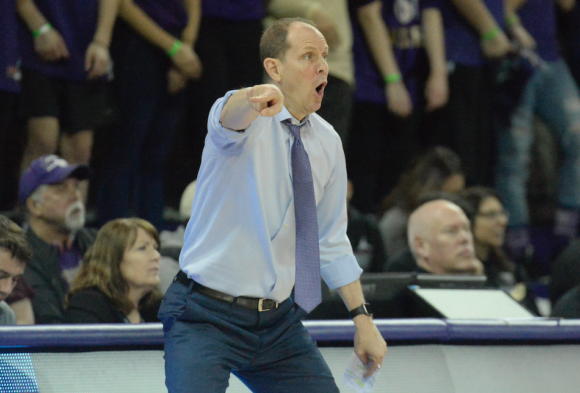 Presuming the Huskies win the league tourney — a much bigger presumption than a week earlier — the NCAA tournament selection committee may award the Huskies with a less favorable seed than what the purple optimists envisioned. And if they don’t win the automatic berth that goes with the tourney title, the shot at an at-large bit shrinks because of the ick factor of the Pac-12. But at least the Huskies didn’t spit up a second time on the trip. It looked like much more than BS with 10 seconds to go when Jaylen Nowell missed the front end of a 1-and-1 free throw to give the Cardinal a chance to win. Out of timeouts, Stanford, which beat Washington State 98-50 Thursday, ended up with an off-balance 3-point shot from J.Z. Okpala, who drew more than two dozen NBA scouts to observe a potential draft lottery pick. He missed, and the taller hosts couldn’t secure the rebound away from Noah Dickerson as the horn sounded. Okpala, who had 22 points in the teams’ first meeting, was held to six points and four rebounds. With 15 minutes remaining, Nowell, Dickerson and reserve Naz Carter all had four fouls. But none fouled out as Hopkins shuffled the lineup and found enough production from backups. Nowell led Washington, which shot 35 percent from the field (same as Stanford), with 13 points. Stanford, which played without starter Daejon Davis, a former Garfield High School star and Washington recruit, because of a foot injury, was led by seven-foot senior center Josh Sharma with 16. Thiel: Psst — wanna buy a part of the Pac-12? Good report, Art, with your usual dose of choice turns of phrase. Sounds like the Huskies have a lot of improving to do. They do, but it’s not as if they haven’t played well this season. Never forget, you’re dealing with 20-year-old guys. Those are two very, very bad basketball teams. OK, Stanford is just bad. Cal is very bad. This doesn’t really bode well for March. As I’m sure you know, in college basketball, past performance is no guarantee of anything in mid-March. True, that. Just not a great time to look quite that terrible (beginning of March, right after cracking the top-25). What may “bode well for March” is that the Huskies give up few points, usually under 70. A win is a win and winning in Stanford isn’t easy. If the Dawgs won at Cal but lost this game by a basket this road trip would be considered successful instead of frustrating. Well, we can play the if/then game with every outcome. They didn’t look good in either game. Doesn’t mean they can’t recover. “was little more than being the world’s tallest dwarf” Yet another Thiel “classic”. Thank you Art for another line that brought a smile! Appreciate the credit, but I think others came first.